Maria Atwood has been a passionate natural health advocate for most of her life. Having been reared in a household where her Mother grew large gardens, cooked and baked with traditional foods like lard, butter, cream, whole grains and fresh herbs, it was easy for her to pick-up the how to, early on. In the late fifties Maria's Mother along with millions of other women abandoned many of these whole foods for the sake of convenience in the form of white flour, vegetable oils, margarine, white sugar, canned and frozen foods. As a result, in the mid 60's Maria assisted her Mom through an operation in which a good portion of her stomach was removed and her esophagus was seamed, due to "Acid Reflux", a condition that had never occurred during the period of time when she was cooking with whole and traditional foods. This highly unusual and unnecessary procedure brought her Mother to deaths door. Sitting quietly by her bedside, waiting for the dread moment of her Mom's death which the doctors had predicted was inevitable, Maria made a promise that if her Mother survived, she would devote as much time as possible to better understand what had caused this illness and to teach others how they could create the most wealth producing investment portfolio there is: - " The preservation of one's health"
Not only did her Mother survive the operation, but with Maria's help she went on to live another 25+ years after returning to those foods on which she had reared her family, prior to her mistaken conversion to using dead and fake foods. She passed away in 1999 at the age 92. During a portion of that time Maria owned a small office supply store in Aurora CO and in the summer of 1999 after her business succumb to the large office supply discount stores, Maria went to work as Senior Buyer for large government contractor. During that time, studied and received her CNHP, which stands for "Certified Natural Health Professional". She also earned a certification as a medical aroma therapist under the tutelage of Dr. Raphael d'Angelo, Aurora , CO . 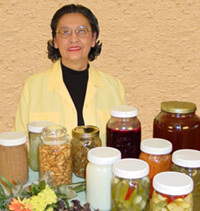 In 2003 Maria was invited to a seminar in which Sally Fallon, author of the cookbook "Nourishing Traditions" spoke on traditional food preparation. In Maria's mind there was no further doubt about which foods model was the best. It was now simple to see that what her Mother, Grandmother and past ancestors had originally eaten, was in fact the secret which helped them to farm into their late 70's & 80's, and to avoid most of the modern and devastating illness, including obesity which we are now witnessing after the introduction of these dead and fake foods world wide.
" After joining The Weston A. Price Foundation I nevertheless found myself failing to regain my health. In time I and others can testify that there must first be a serious willingness to replace activities that do nothing to nourish the body, mind, and soul with those that genuinely do! Without this commitment you will no doubt flounder, and later say "It didn't really work for me"! This commitment, may even mean reconsidering your career, working less hours, and of great importance in my case was too reduce my involvements in clubs, organizations, and or other worthy BUT time consuming endeavors that had kept me from being able to focus on the one thing that WILL , and did allow me to do more. BETTER HEALTH!" by learning how to properly nourish my body, and thereby benefit my mind, and yes, my soul . Bio - Maria Atwood is a semi-retired Certified Natural Health Professional and Weston A. Price Chapter Leader in Colorado Springs, CO. Her website, Traditional Cook , offers 100 percent lead-free stoneware, made in the USA for the best baking ever! You'll also find the Wonder Mixer as well as the #1 rated grain mill, Wondermill. Maria's “Cook Your Way to Wellness” DVD and booklet is available on demand at Vimeo.com and also sold as a full set on Selene River Press. Be sure to join the Selene River Press newsletter to follow Maria's Tips from The Traditional Cook blog posts.